In this thorough, readable takedown of Big Oil, the most profitable industry in the world, Juhasz (The Bush Agenda) exposes the ways in which a half dozen oil companies have achieved control over American families and U.S. politics, triggering environmental and humanitarian catastrophes they have no intention of resolving. Within 10 years of Standard Oil's founding in 1870, John D. Rockefeller monopolized the refining, marketing and output of U.S. oil; ever since 1890's Sherman Antitrust Act split the company into small constituent parts, oil players have scrambled to evade regulation, regather into ever-larger corporations and regain the ability to set prices and control output. Debunking industry claims over recent oil price escalation, Juhasz exposes how Big Oil has used techniques like speculative futures markets and the ""Enron Loophole""?along with massive operations opacity?to reap record profits year after year while growing their political influence; indeed, Juhasz locates the current ""oiligarchy"" making ""the most pressing decisions of our time"" from inside George W. Bush's White House, crafting policy and advocating war. 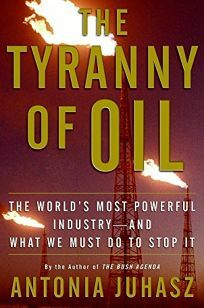 Calling for a ""Separation of Oil and State,"" this excellent, wide-ranging study of disastrous monopoly capitalism should shake up notions that major energy players are interested in any alternative to more oil, money and power.